– that once they colored their hair they would regret their color choice. Well ladies, do I have news for you! Thanks to the Beauties at Joico, you too can have vibrant color with or without the commitment! Let me introduce you to Joico Instatint and Joico Vero Kpak Color Intensity! Perfect trial size cans and bottles! For those of you who are a little more adventurous, Joico Vero Kpak Color Intensity is a semi permanent color option and is easy to use and easy to apply. No peroxide/developer needed! Apply to dry hair, leave on for 20 -30 minutes and VOILA! Vibrant color! (For our dark hair beauties, pre lightening may be needed, depending on how vibrant you want the color to be). Always use a color shampoo to retain the vibrancy of the color. I personally adore the Joico Kpak Color Therapy line, nourishes and repairs while keeping my color bright. Your new found color lasts for up to 30 washes. For those who are a tad nervous about trying something new, you will love the latest addition to the Joico family. Instatint is a temporary aerosol color spray, that lasts until you shampoo it out. Apply to dry hair and VOILA! instant color without the commitment. The colors are vibrant enough for all hair colors, from blonde to the darkest of brunette. Spray lightly for a pastel effect, the more you spray, the darker the effect. *I suggest covering your shoulders while applying the color, to protect your clothes. No need to fear the storm clouds in the forecast – the color will not run if you find yourself caught in the rain. *That Girl in the Red Coat tip – do not apply heat to your hair once Instatint is applied – there may be a chance of staining your tresses. Use your curling iron or flat iron before applying Instatint. So there you have it. Now you too can add a splash of color! No fear, no commitment. Only FAB! hair that turns heads…like yours truly. This morning, did you find yourself looking at your reflection and your dry tresses, wondering where the shine and vibrancy of your color went? Did the thought “I wonder if I could pull off a pixie cut?” pass through your mind because you felt there isn’t anything to help your hair and return it to what it once was. Well Beauties, do I have news for you. There is a new kid on the block and it will become your new bff! 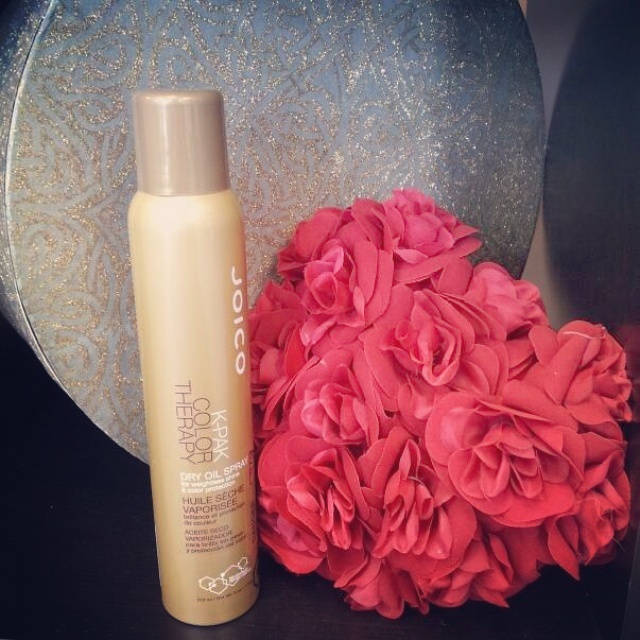 The Beauties at Joico have created a real gem. Let me introduce you to Kpak Color Therapy Luster Lock! INSTANT Shine and Repair Treatment! Luster Lock offers a FAB! glow, shine and vibrancy to your color treated tresses. It is formulated for all hair types, from fine to thick. For blondes, brunettes, highlights, lowlight, ombres…you name it…Luster Lock rejuvenates any color, all the while boosting your hair’s strength to make it 9 times more resistant to breakage. *For this non-blonde blonde, let me tell you, it’s like the heavens opened up and the angels began to sing! apply to dry hair as a pre shampoo treatment for that extra boost of repair and protection. apply to clean, damp hair. Leave in for a minute or two, then rinse with cool water. Dry and style as usual. Myself, I prefer the old fashioned application on clean, damp hair. Luster Lock brightened up my magenta, added luster to my blonde and did not weigh down my fine tresses in the least. I found my hair to feel softer and my flat iron glided with ease. (Those of us who like to play with our color know all to well the tug/skid feeling we can get from our flat iron). So, before you pick up the pair of scissors closest to you or call your stylist to book an inaudible hair appointment, save yourself some grief and your stylist nightmares from hearing the sobs through the phone and go get yourself some Luster Lock. I promise you, you will not regret it.